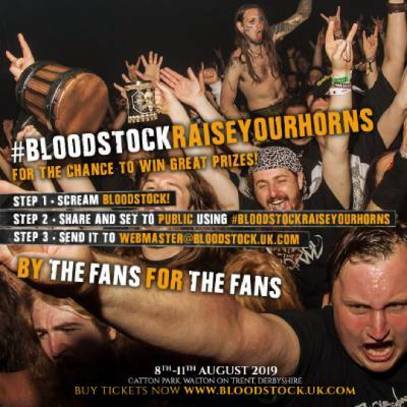 BLOODSTOCK want you to Raise Your Horns! All you need to do (either alone or together with some mates, or pets, or family members - be creative) is warm up your vocal cords, switch on your phone video, raise your horns and shout your best 'BLOODSTOCK'! Then share the video clip to your social media (being sure to set your post to 'public', so we can see it) with the #BLOODSTOCKRAISEYOURHORNS hashtag (so we can find it) and then additionally, email your video clip and your contact details to webmaster@bloodstock.uk.com. The best clips will be edited together into a fun video compilation, showcasing all our fans and their BOA loyalty! Our favourite clips will win from an array of BLOODSTOCK related prizes, including VIP tickets for this year! What are you waiting for? Get posting!! Closing date for posting your entry on social media is 11th April 2019. Winners will be notified by return email.